It's no great mystery that momentum in bond markets (at least in 10yr Treasury yields and MBS) is sharply sideways at the moment--not only in terms of the trajectory of the range, but also in terms of that range's narrowness. For the time being, we can chalk this up to a Thanksgiving week that is traditionally lightly-traded combined with indecision ahead of the tax bill uncertainty that will play out in the coming weeks. Longer-term bonds are splitting the difference between a stock rally and a European bond rally. The tanking yield curve (falling green line) is also helping fuel demand relative to shorter-term debt. To whatever extent momentum is "too flat" to be interesting at the moment, it paradoxically becomes interesting because of its implication. 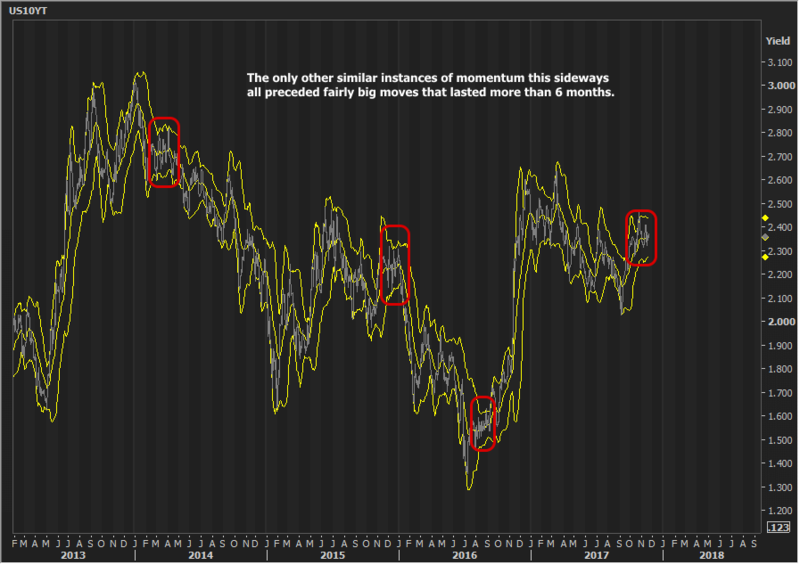 The chart above doesn't go back far enough to see similar examples of flat/sideways momentum. True, early 2017 is somewhat similar, but what happens if we go back and find other instances of Bollinger Bands (the yellow lines) flattening out this much and remaining this narrow? The examples are hard to spot unless you happen to have a chart that highlights them in red. The other 3 highlighted sections of this chart are the only 3 that meet the same requirements as the current trend (bollinger bands in a range tighter than 30bps for at least a month). As you can see, this much sideways indecision is usually a sign of pent-up momentum. December and January should be "fun"--hopefully the good kind. As for today, it's just another day spent waiting for "fun." It stands very little chance of having any sort of implication on the future.